Add a solid wood edge to the ends of your plywood or MDF shelving for a neat, finished look. Can also be used in the place of conventional tongue & groove joints where a perfect fit is necessary. The 90 degree design provides for easy and precise set up. Use with up to 1" stock. Two flute carbide cutters & 1/2" shanks. 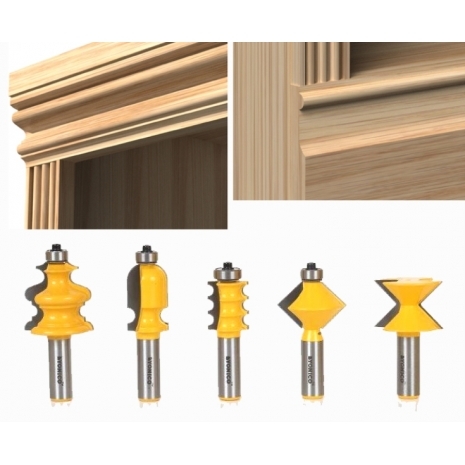 Add dramatic moldings to furniture or make crown moldings, base, case and chair rails all with this one bit. Two flute carbide cutters with ball bearing guides. 1/2" shank. Create triple bead column and face moldings to add a beautiful finished look to a wide range of projects. Two flute carbide cutters with ball bearing guide. 1/2" shank.